Nurses normally offer comfort and care when you are injured or sick. Not so with this nurse. 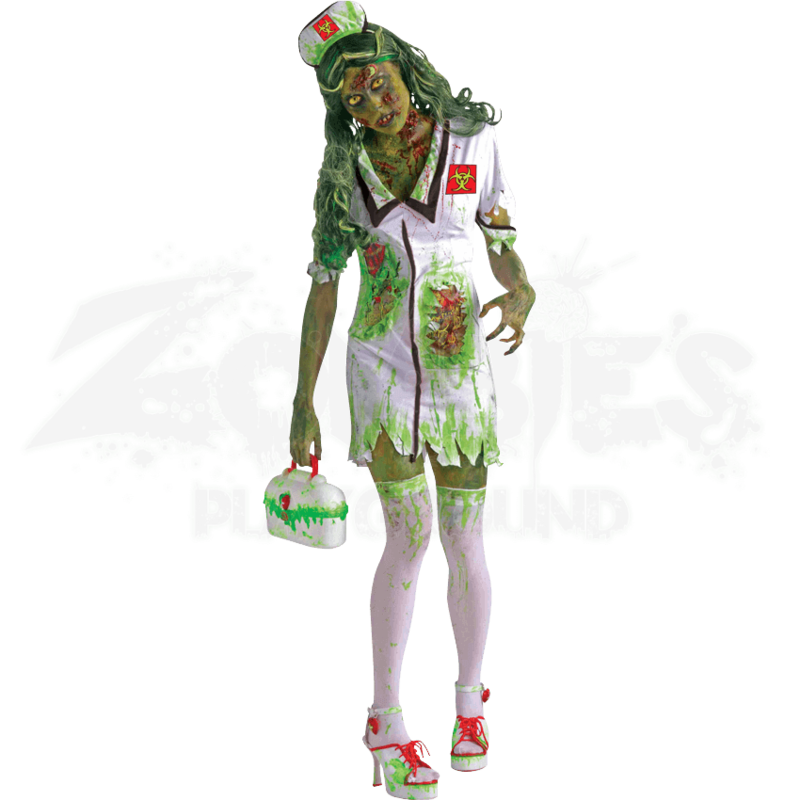 When you are dressed up in this Biohazard Zombie Nurse Costume, you will look like a flesh eating ghoul ready to feast on the weak and sickly. This costume consists of a simple one-piece dress that is modeled after a classic nurse uniforms from years past. The dress features a V-neckline with a folded collar with black edges, as well as short, tattered sleeves. A red patch adorns one side of the dress, featuring a bright green biohazard symbol. The hem of the dress is tattered, while two sections of the dress are torn open to reveal tattered flesh and internal organs saturated with toxic goo. Bright green biohazard materials stain the dress, as well as faint spatters of blood. Also included is a classic nurse cap that can be worn atop the head and features a matching red patch with a bright green biohazard symbol. Please note that the costume includes only the head piece and the dress. Any other accessories, including the hand bag, the stockings, the shoes, the wig, and make-up, are not included. This costume is available in one standard size, which fits between a 34-38 inch bust and a 26-32 inch waist. 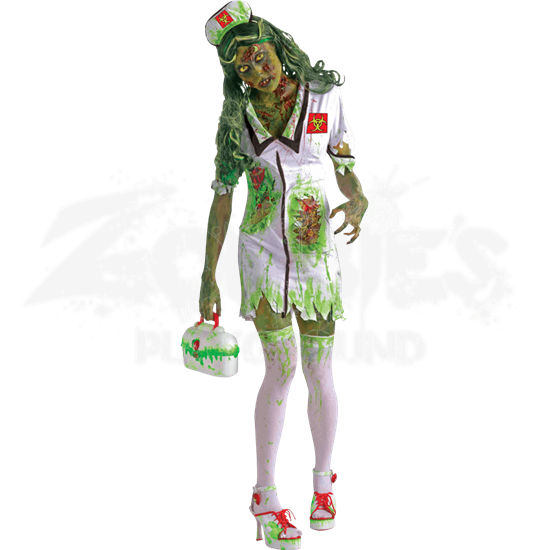 Do not expect anyone in this Biohazard Zombie Nurse Costume to tend your needs and look after your well-being, because based on her looks, she is more the type to feast on your remains. This costume pairs nicely with a variety of other zombified medical looks.